The Otolaryngologist Head and Neck Surgeon is the most highly qualified specialist to diagnose and treat both skin cancer and other forms of head and neck cancer. We also are trained in facial plastics so closure of defects and complex cancer reconstructions are naturally within the realm of the Head and Neck Surgeon. 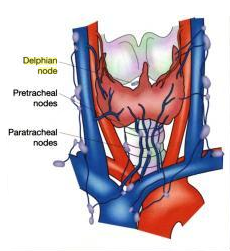 The thyroid and parathyroid are endocrine structures located in the neck and are also intimately associated with the nerves that innervate the voice box. Otolaryngologists are trained in managing all forms of thyroid and parathyroid disorders and routinely operate on those structures. This year’s Oral, Head and Neck Cancer Awareness Week (OHANCAW) is April 12-18, 2010. OHANCAW is a weeklong series of events to promote education and awareness and is sponsored by the Head and Neck Cancer Alliance (formerly known as the Yul Brynner Head and Neck Foundation). The highlight of OHANCAW is a day of free screenings across the country. All you have to do to “Discover a Healthy New You!” is open your mouth! FREE screenings for oral, head and neck cancer will be scheduled at Midwest Ear, Nose and Throat from 9:00 AM to 4:00 PM on Thursday, April 15, 2010. Please call 605-336-3503 or toll free 1-888-336-3503 to schedule your free screening. !